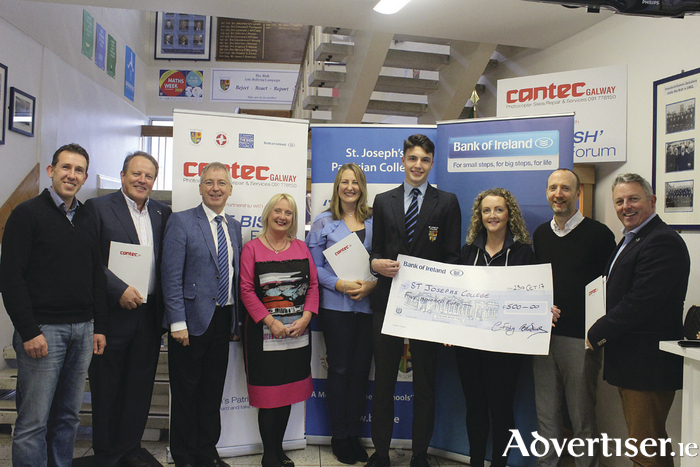 At the launch of The Bish Careers Forum 2017 were L to R: Lorcan Mannion (parents' council), Aidan Goulding (event co-sponsor, Cantec), Ciaran Doyle principal), Hazel Morrison-Pagett (board of management & event co-ordinator), Valerie Davis-Mahon (chair of parents' council), Jack Keady (head prefect), Caroline Fahy (event co-Sponsor, Bank of Ireland), Barry McDermott (Careers guidance counsellor), Ray Devlin (event co-sponsor, Cantec). The Galway County Council has submitted an application for funding to Enterprise Ireland for a BIA Innovator Campus to be constructed on a site provided by Teagasc at the Mellows Campus in Athenry. The council hopes the project will address the need for regional workspace infrastructure by realising a dynamic food and drink innovation and incubation centre comprising more than 23,000 square feet. It is estimated that the project will create 360 jobs, more than 40 businesses as well as providing training, development, and support to in excess of 2,400 entrepreneurs and learners in the first three years of operation. Councillors warmly welcomed the news which was revealed at County Hall on Monday. Cllr Peter Feeney said; "There is a lack of this sort of development in the west and it is very important that it goes ahead. This is the sort of thing Galway County Council should be involved in because economic development in any capacity is very important for the county. We have our fingers crossed that it is successful." County cathaoirleach Eileen Mannion echoed Cllr Feeney's sentiments saying that it was an exciting programme, which would hopefully come to fruition. Fine Gael councillor Niamh Byrne also added that it wa very pleasing to see the potential of 360 jobs being created if the funding can be secured. Page generated in 0.1894 seconds.